Loam Layer, Sandy soil layer, Cohesive soil layer, Gravelly soil layer. To enter into a Pollution Control Agreement based on the Tochigi Living Environment Preservation Act, and a Pollution Agreement with the city. Ground water (use amount: 8,100 t/day). To drain by drainage pipe after the processing (BOD 8 mg./liter or less) by each company individually. High voltage (6kV): Supply facilities are available in the park. 3 km, 5 minutes by car, from Moka station on Moka Railways Line. 11 km, 20 minutes by car, from JR Ishibashi station on JR Utsunomiya Line. 15 km, 35 minutes by car, from JR Utsunomiya station on JR Utsunomiya Line or Tohoku Shinkansen. Next to Moka interchange of Kitakanto Expressway. 7 km, 15 minutes, from Nationa Route 4. Next to Kinu-Techno-Dori, National Route 408. Moka City Industry Locations Promotion Project Subsidies Delivery Outline Enterprises, etc. attracted specifically by the Mayor of the city, and corresponds to all following requirements. 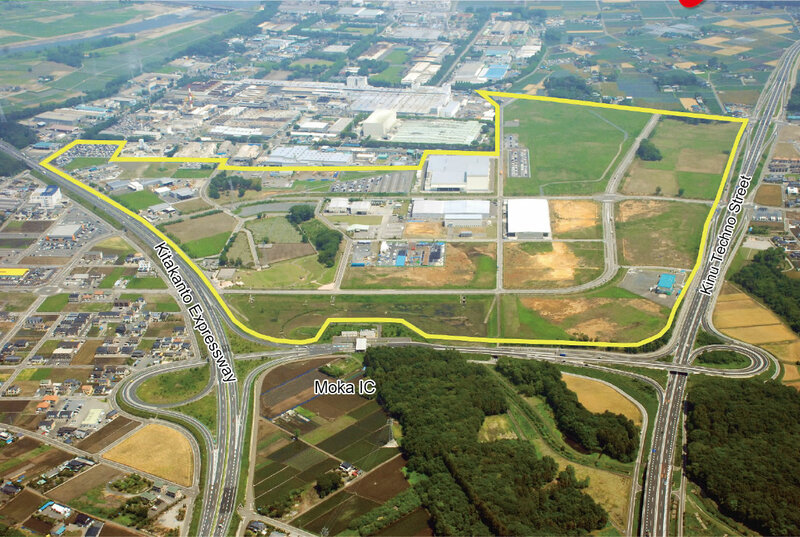 To acquire site areas of 1,000m2 or more. To operate within 5 years from the acquisition of the land. To complete payment for fixed assets tax, etc. An equivalent amount of the fixed assets tax for the invested fixed assets, such as land. Limit amount: 100 million yen. 1/3 of the greening operation expenses. For 1 enterprise 1 time. Limit amount: 5 million yen. Limit amount: 3 million yen. 30 % of the water charge. For 1 enterprise 3 times. Limit amount: 1 million yen per each year.